If you know me in real life, or you had paid enough attention to this blog, you know Nick. He's my BFF. My NBoo. The baby cub to my mama bear. Since Nick and I have followed each other through life, we get a lot of questions. When I started working at Midland a year ago, we discussed ahead of time how to explain our friendship. I think we decided on "we're friends from high school". But as people see how close (and twisted, and ridiculous, and co-dependent) our relationship is, they know there is more to the story. Nick and I met clear back in 1995...I think...when I started dating his brother. I was a sophomore, Matt was a junior, and Nick was a baby. Well, not a baby. I think he was in middle school. I have always been confused about Nick's age, or exactly how much younger he is than me, even though I know he was born in 1983. The only time I have been 100% certain of his age is when we threw him a surprise 29th birthday party. Anyway, at that point in our lives, Nick was just the annoying little brother. He was constantly trying to catch Matt and I making out, lurking around the corner trying to capture the romance with his Teenage Mutant Ninja Turtles camera. Matt would catch him and a beating would start. One night, however, Nick got to hang out with us and he said something about how he wanted to go to prom all four years of high school. 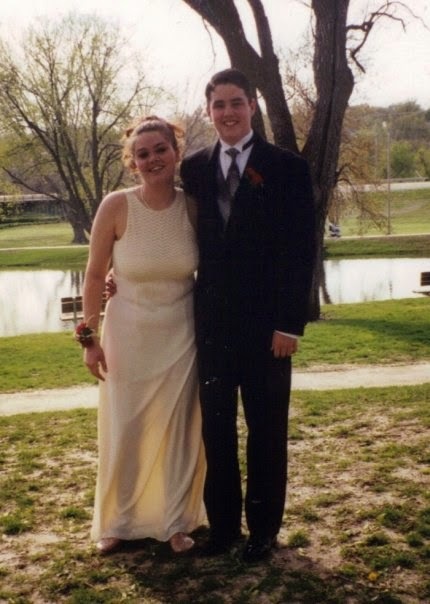 Anyway, so I was right about Matt, and I ended up taking a young Nick Boone to prom that year. For some reason, it was a thing that year for the girls in my clique to take younger guys (one of them even married her young boy) and so it didn't seem like anything weird. 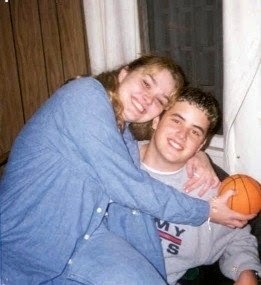 He was my sidekick my entire senior year, actually. He went along with senior girls everywhere - football games, basketball games, movies, parties. It was great. I have to admit though, sometimes I hung out with him because I knew it drove his brother bananas. But for the most part, Nick was just hilarious and fun to hang out with. My friends all loved him too. Then graduation came, and it was time for me to leave for Buena Vista University. However, we still had one more summer of shenanigans, and since his brother and my brother were B.F.F. 's who had just rented an apartment (the first of our group to have their own place! ), most of the chaos took place there. It was ridiculous, kinda disgusting, but unforgettable and the perfect way to end my high school life. And yes, it was weird hanging out with my ex constantly, but we weren't exactly normal, either. My first few weeks at college were really hard for me. I met a lot of awesome girls and I was keeping busy, but I was incredibly homesick for my family, my girlfriends and Nick. I made Nick promise me that every Monday night at 9pm we could talk on the phone. Keep in mind, this was before texting and cell phones. We did have our AOL instant messenger screen names (beaver2141 and gormar2413) but that wasn't consistent, and it required actually sitting at a computer rather than texting over a phone (kids today have it SO EASY). So every single Monday night we had a phone date to catch up. Over the next three years, I saw Nick whenever I was home on breaks and we kept in touch while I was in Storm Lake. One weekend during my junior year he came to visit, and it happened to be Scholarship Weekend, which was for potential incoming freshmen to apply for Buena Vista specific scholarships. I convinced him to just try it out and see what happened. Well...what happened was he got a good scholarship and ending up coming to BVU the next year. I was at school already when the new freshmen moved in. I had to be there early because I was the Editor-in-Chief for the college newspaper (which just a few weeks later I suckered him into joining). His mom and step-dad came along to move him in, and as soon as they moved his stuff to his room, Nick went to finalize some paperwork. "Well, I guess we're going to take off," his mom said to me. "Tell him I said goodbye." Ummmm....his mom just dumped him off and bolted. I guess she didn't want to deal with a tearful goodbye. But it was okay. I just took my freshman buddy under my wing again, and he hung out with the senior girls again. Of course, now we realize that it's a good thing we only had one year together at BV. I was a lazy piece of crap by that point, diseased with senioritis and obsessed with a boy a few towns over (so I was basically a commuter student). He made awesome new friends who he is still close with to this day. And, of course, after I graduated and Nick became a sophomore, he met Hannah and married her in 2008. Stay tuned for Part 2, where we followed each other to three (yes, three) jobs and he's texting me right now as I type this. Aww. I love this story.